rob mclennan has posted a lovely review on his blog of my latest chapbook Variations on the Stillness of Motion. rob very touchingly calls this chapbook, which deals with grief, “quiet and still and lovely.” Thanks rob! 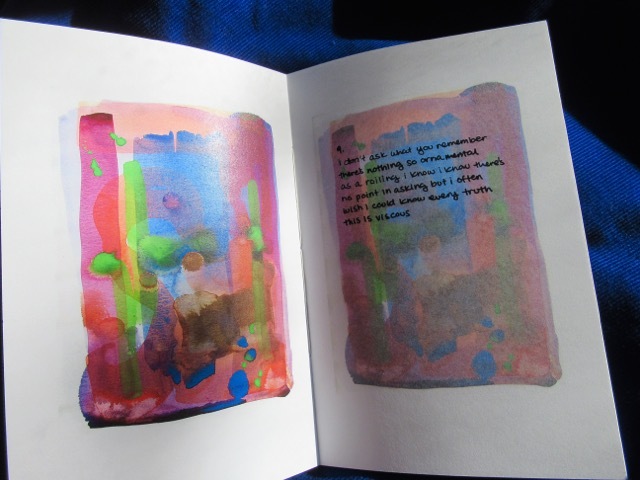 The chapbook Variations on the Stillness of Motion explores grief through both watercolour paintings and poetry. The work is 36 pages long, full colour, with a hand-sewn spine. Copies can be ordered here, through the teacozy store. You can also follow the work along on Instagram, where I’m posting the pages slowly one by one using the hashtag #VariationsOnTheStillnessOfMotion. These pages are interspersed with #eyeSnowScape posts of pieces made together with my late father, Steve Hajnoczky. You can read more about his eyeSnowScape series, his work, and our work together here.